A Camarillo civic and business leader who earned his college degree at 55 will once again don a cap and gown at the CSU Channel Islands (CI) commencement ceremony. 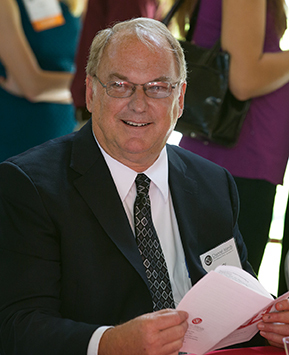 On May 16, Camarillo Chamber of Commerce CEO and CI graduate Gary Cushing, now 60, will accept CI's Distinguished Alumnus Award for his success and generosity in a number of different arenas. "Gary is the definition of the CI Way," said Tania Garcia, Director of Development, Alumni Relations. "He gives back to the community on a regular basis. He is on so many different boards I can't even name them all. He is the community go-to guy because everyone knows they can trust him, and no matter how busy he is, he gets the job done." CI gives the award to an alumnus who has had success in his or her career field, is active in the community and contributes time, talent and other resources back to CI. Cushing says receiving this award is "very special" to him, adding that he does all he can to promote CI because he believes it provides an opportunity for a higher education for a population that wouldn't otherwise be able to pursue a degree. Cushing offers himself as a perfect example. His life was going well at age 52. He had worked his way up through the restaurant ranks—starting as a teen busboy in Burbank—to become the owner of three Marie Callender's restaurants in Ventura County and one in Santa Barbara. He still owns the restaurant in Camarillo, which opened in 1989. He had a wonderful wife, eight children and 13 grandchildren. But family and work responsibilities had always kept one life goal just out of reach. He had never earned a college degree. "My brother and two sisters all had degrees. I was the only one without a degree," Cushing said. "It was always something I wanted to do, but since we never had a university out here, it wasn't possible." CSU Northridge was too much of a commute, but when Ventura County's first four-year public university opened in 2002, Cushing's dream became attainable. "President Rush used to come into the restaurant all the time and I would ask him about the University," Cushing said. With encouragement from President Rush in 2007, he enrolled and in 2010, he graduated with a degree in political science. To his delight, there were other students in their 50s who also were pursuing degrees. Cushing went on to get a master's degree in public policy from California Lutheran University, so now he is the most educated of his siblings. Today, Cushing is President/CEO of the Camarillo Chamber of Commerce and Owner/Principal of Cushing Public Affairs, a firm he founded to lobby for local businesses and organizations. Since he took over the Chamber in January 2014, he has turned it around, increasing membership and cash flow. Not only has Cushing contributed financial resources, time and talent to the University, he has traveled to Sacramento to help lobby for CI, which he believes is essential to the area, and for all students both traditional and non-traditional. "The type of student we have within the CSU system and especially at CI is the student who has a lot of other life challenges," Garcia said. "He or she might be a parent, a single parent, or might be the first in the family to go to college. I think Gary is the epitome of the idea that, no matter what your situation, you can reach success and the University is here to support you in whatever way you need." The CI Alumni & Friends Association provides services to its graduates with career help and a mentorship program. The association also keeps alumni involved with the University community and encourages alumni philanthropy, as CI's graduates are the future developers of the campus. CSU Channel Islands (CI) is the only four-year, public university in Ventura County and is known for its interdisciplinary, multicultural and international perspectives, and its emphasis on experiential and service learning. CI's strong academic programs focus on business, sciences, liberal studies, teaching credentials, and innovative master's degrees. Students benefit from individual attention, up-to-date technology, and classroom instruction augmented by outstanding faculty research. CI has been designated by the U.S. Department of Education as a Hispanic-Serving Institution and is committed to serving students of all backgrounds from the region and beyond. Connect with and learn more about CI by visiting CI's Social Media.